Leprosy, also known as Hansen's Disease, is a bacterial disease. The leprosy bacillus usually inhabits the cooler extremities of the human body (hands, ears, nose). It's theorized that the armadillo can carry it because of yet another fascinating armadillo trait: low body temperature. Armadillos usually maintain a body temperature of around 90 degrees Fahrenheit. This provides an environment conducive to the bacterial growth. Furthermore, armadillos can live for a long time, which gives the slow-developing disease a chance to take off and do its dirty business. Thus, armadillos are used in the study of leprosy, since it's apparently impossible to grow the bacteria in a laboratory environment. In fact, according to the reports, researchers collected the animals in the 1960's, merely guessing that they'd be good test subjects to introduce the disease to, and found that many armadillos already had leprosy. I think these research efforts have resulted in the development of a vaccine, but it's not 100% effective. *UPDATE - I just read, on 4.27.2011, that armadillos HAVE transmitted leprosy to people. In an article titled "DNA tests link Southern leprosy cases to armadillo", it was revealed that government researchers at the National Hansen's Disease Programs in Baton Rouge, LA found that the DNA from leprosy samples of both armadillos and leprosy patients in the southern USA matched, and that this DNA was different from the leprosy DNA in other parts of the world. Apparently you've got to, like eat armadillos or frequently handle them or cuddle with them or something in order to get the disease. Apparently 150 cases pop up in the US each year. It's not known how many are due to dillos, but most of the cases are in dillo range. Huh. So there you have it. This explains why my nose fell off last week. The risk of contracting leprosy increases if one eats the animal. I have handled many armadillos, including with my bare hands, but I have never eaten armadillo meat, although I have met many people who have. Some people are just curious about the taste, and others are simply more akin to bushmeat hunters, who will eat anything. I'm sure, as with any food, armadillo is "considered a delicacy" in some parts of the country. Everything is considered a delicacy by someone. However, after learning about the risk of contracting leprosy due to eating dillo meat, perhaps people will consider abstaining from dining on dillo on the half shell. Read my full armadillo blog! Visit my Armadillo Blog for all kinds of armadillo stories. 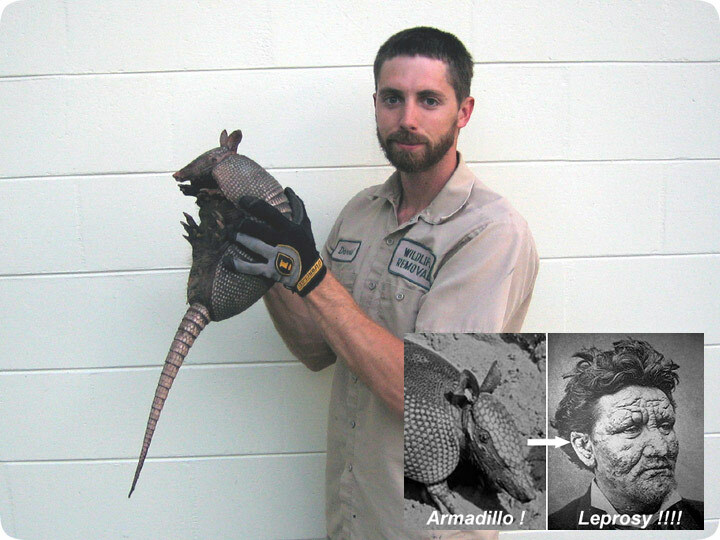 I recently googled "armadillo leprosy" to settle a debate with a friend. Good news! I was right! As you well know, they DO carry leprosy. You know other cool things as well, stuff that I didn't know so I kept reading the website. The second bit of good news then is that you've got a really cool and informative website! I'm just writing to extend you a kudos for having a really great website and to let you know that I'm bummed that you stopped writing blog entries! I thought a lot of the things you said on your website and in the blog were informative and funny. I see that you've got some basic search engine optimization in place on your site so you're clearly aware of web design. As far as furthering your search engine rankings I'm sure that if you put a blog on Wordpress or started a video blog on YouTube you'd bring a lot more traffic back to your site. You're really clever and funny, more people should see you and appreciate your message! p.s. I just planned on quietly appreciating your website to myself when I saw your blog post about poisoning the mole with Iocane powder. HILARIOUS! A man who appreciates Princess Bride must be told that his humor rocks!